Die Wahlverwandtschaften (Elective Affinities) introduces us to Eduard and Charlotte, a middle-aged couple living in peaceful seclusion in their very big house in the country. The two have loved each other from a young age, but only recently managed to come together after the deaths of their respective spouses. Unsurprisingly, theirs is a rather withdrawn existence, in which they’re seeking to make up for the years they spent apart. The title is an interesting one, typical of a man who was less a writer than a polymath with an interest in virtually everything (including, as I am unable to forget, rocks…). The short afterword in my edition of the book explains that the great man produced thirteen volumes of writings on natural sciences, running to over 6000 pages, and he had a particular interest in chemistry. This is where the titular elective affinities come in, explaining as they do the tendencies of seemingly solid substances to separate in the presence of other chemicals, with a preference for another arrangement displacing the original structure. It isn’t hard to see the relevance to this novel – in Die Wahlverwandtschaften, as is the case with chemical bonds, marriage ties can be far looser than you might expect. Of course, the success of any reaction depends on the elements you throw together, and the outsiders (the talented, handsome, sober Captain, along with the attractive, accomplished Ottilie) are fairly inert. If there’s an unstable element here, it’s certainly Eduard: rash, passionate, headstrong, spoilt – he wants what he wants, and he’ll cry if he doesn’t get it. The biggest character of the four, he’s oblivious to others’ needs and pushes ahead against the best of advice (an example of this is his insistence on continuing with his surprise of a fireworks display for Ottilie, even after a tragedy in the vicinity). There’s always a sense that his impatience will bring about disaster, and that’s exactly what comes about in the final pages of the novel. 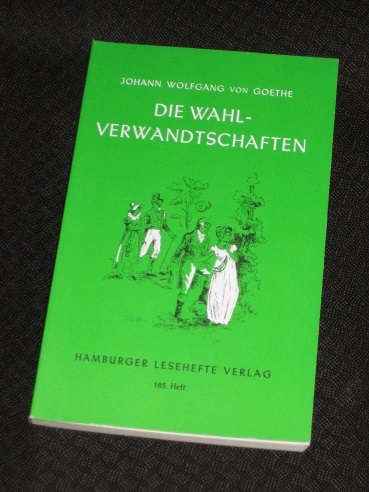 Die Wahlverwandtschaften is a clever book, with a style swinging between a sober naturalism and hints of the romantic; Eduard is no Werther, but there’s a lot of sobbing and wailing for one book. At times, the story can be a little Gothic, too, as we’re shown the old castle, secret passages used for nocturnal encounters and a night vigil in the church crypt. The subject matter appears fairly daring for the period (again, if we compare the story with Austen’s romances…), but the writer may have been letting off the steam caused by his own personal issues; needing steady employment in Weimar, he wasn’t quite as daring as Eduard in his domestic affairs. The story does sag a little at the start of the second half when the two main male characters disappear for a while, but it soon picks up again, gradually building to an excellent, dramatic finish. “Wasn’t quite as daring in his own domestic affairs” I beg to differ – even more so I might suggest. He lived “in sin” with Christiane Vulpius from 1788 – quite the scandal in those days. True, he finally married her in 1806, but our Goethe had a wandering eye and quite a passion for a much younger shall we say “specimen” (in the context of Elective Affinities it seems appropriate) by 1809. I think, but am not sure that she was called Ottilie …. So maybe Goethe was thinking about potential consequences of following through on his own chemical reactions …. Funnily enought, Goethe did both those things, with the same woman. Some going that! Thanks for reminding me about this novel – I’ve read about it and often meant to read it. Must get a copy. Simon – Well, mine’s been hanging around for years; it was about time I got around to actually reading it!